Did you know you can create custom wave patterns with any 1-10V pump? Only ProfiLux with it´s unique current control can offer you the flexibility to create your own fully customized wave patterns! Create several simple and/or very complex current programs, including high/low tide, waves, surge, random or night mode settings. The current control is organized in groups, one group consists of one or several pumps. 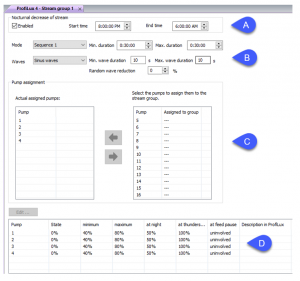 The settings can be made separately for each group and for each pump. 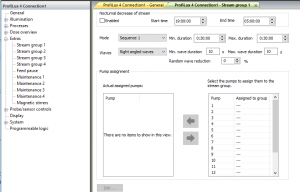 With this Stream Group feature you can set the behavior of any 1-10V compatible pump. Whether you’re working with Tunze Streams®, Waveline® pumps, Red Dragon® pumps, or any 1-10V pump, you can control pump wave patterns as a group or independently. The group settings define the pumps belonging to the group, the operational mode and the time settings (depending on the operational mode). 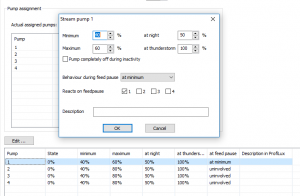 For each pump, settings such as wave duration, minimal or maximal speed or the behavior during the feed pause can be set individually. 4 independent groups can be programmed. A group consists of up to 4 (or up to 16) pumps which can be independently controlled. 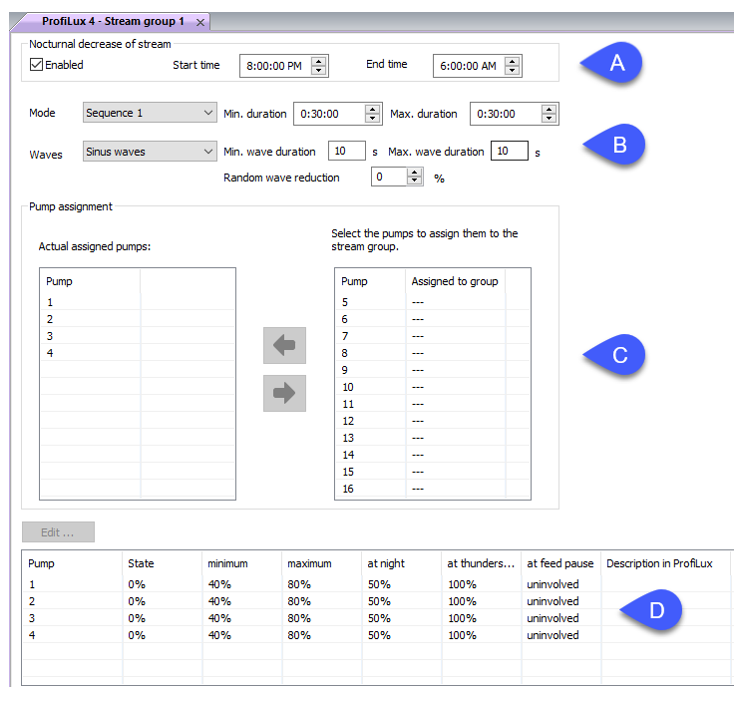 In order to make the flow simulation as natural as possible, ProfiLux offers you various unique setting options and random modes. Specify wich pattern (e.g. Sequence, Random, Surge) your pumps should run and how long this mode should last (Min./ max. duration). Determine the duration of each wave (Min./ max. wave duration). Set the strength of the wave, even ramdom variation is possible (Random wave reduction). The individual groups may have different modes. The pumps of this group are permanently off. The pumps are permanently active and operate alternating, i.e. if pump 1 runs at maximum speed, pump 2 runs at minimum speed and vice versa. Here, always exactly one current pump of this group is switched on alternating. The duration for the change from one pump to the next one can be set, see below. When the last pump of this group was active, the cycle starts again with the first pump of this group. If this group consists of 2 pumps, then the ebb-tide-simulation is generated. If only one pump belongs to this group, it is switched on and off alternating. Similar to Sequence 1, but the pumps are not switched one after the other, instead of that, they are activated in an alternating order. The pumps of this group are switched on one after the other until all pumps are active, then the pumps are switched off again in the same order until all are off. The time until the switching state changes again can be set. Similar to Surge 1. This setting allows all pumps to be switches off in the reverse order as they were previously switching on. Using a random generator, all, some or none of the pumps belonging to this group are activated in a continuous random variation. The time until the switching state changes again can be set . A: Nocturnal decrease feature allows you to run the pump(s) at a lower speed at night. 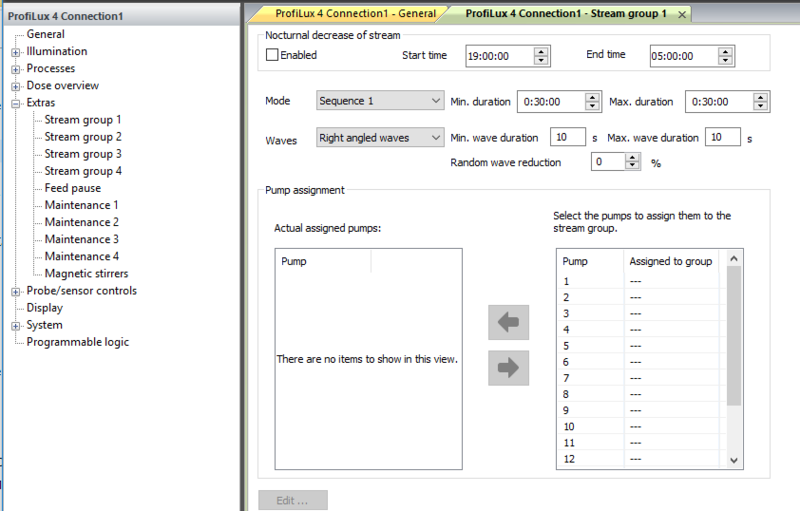 B: Choose from several wave mode options to run pumps together or in sequence. Min/Max duration allows you to fine-tune the timing of the pumps. Sinus waves gradually ramp up and ramp down the flow between the minimum and maximum speed. Right-angled waves create a sudden jump in flow output. C: Pumps that will react to the above settings can be assigned here. D: Assigned pumps min/max speeds are set here. 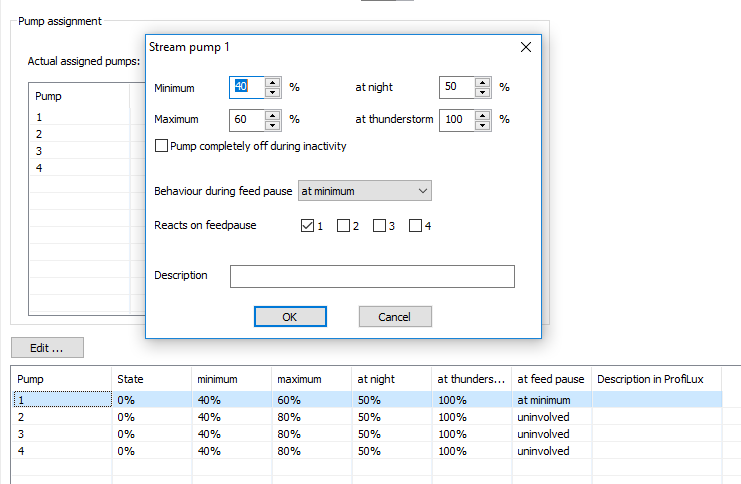 You can also set how the pump(s) will react at night, during thunderstorms, and during feed pauses.